Stones looks right at home in a garden. You can use them as paving or walling, to create furniture or art, or in a more natural state in the form of feature rocks or decorative pebbles. Boulders and large feature rocks can be used to great effect in a wide range of garden styles, but if you have the space, they really come into their own when used to help build a bushland-style water cascade, a billabong-inspired pool, or a native garden. In this edition, we tell you what you need to know about landscaping with rocks and pebbles and we take a special look at what is becoming a popular outdoor trend: rock-filled gabion walls. 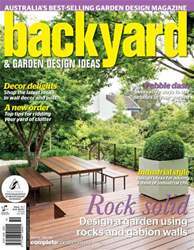 We also turn the spotlight on pots and planters, wall art, garage storage solutions and industrial-style garden design.